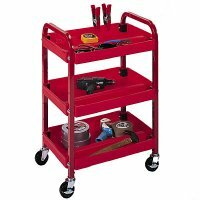 Three shelf compact adjustable utility cart constructed of blow-molded plastic with metal frame. Complete with 3" heavy duty casters, 2 with brakes. Dimensions: 22"W x 151/2"D x 32"H.